The activists, many who represent the organization Deep Green Resistance, initially blocked the open-faced train with a tripod set up on a rail trestle beginning at around 4pm Saturday. When the activist in the tripod was finally extracted by law enforcement eight hours later, a second group of activists locked themselves in an undisclosed location somewhere along the halted mile-and-a-half long train. It was around 3am when the two additional locked-down activists were finally discovered and cut out of their devices. All three activists were charged with trespassing, resisting arrest and obstruction of a train. With the coal train unable to move for almost twelve hours and only three individuals charged, this blockade is one of the longest sustained disruptions of the fossil fuel industry with the least number of arrests in recent activist history. Open-faced coal trains, mostly coming from extraction sites in the Powder River Basin, pass through Bellingham on a daily basis, leaving toxic coal dust that pollutes the air, water and soil in their wake. In the current context of accelerating climate change, increased resistance to coal transportation in the region means a fighting chance for survival of salmon, foxes, blue heron, Peregrine falcon, harbor seals, Orca whales, shellfish and so many more precious creatures. During the action, the person in the tripod held a sign that said “Fight for What You Love,” and was kept company by his fellow activists and a large group of community members who came out in kayaks to show their support. Those who have spent any time trying to protect wild places are familiar with the struggle to enact change within the cumbersome legal system and can articulate the disappointing measure of bureaucracy. Many have been organizing for decades and have seen few victories. A survey of the activists at the site of yesterday’s action revealed a history of lobbying, policy making, publishing, educating, and participating in symbolic protests, but the failure of those actions to lead to measurable change lead the activists to turn to civil disobedience. These activists, like many others, consider direct action as the only means left for survival. The wave of direct actions this summer, from the mass occupation of train tracks in Anacortes, Washington to the blockade of a clear cut lead by Karuk activists in the Klamath National forest and the lockdown to train tracks in Mosier, Oregon is testimony to the growing mass of activists ready to amp up the struggle for ecological health. Yesterday’s blockade was a major success in halting the cogs of the fossil fuel industry and sending a clear message that those who care for the living planet are willing to fight for it. 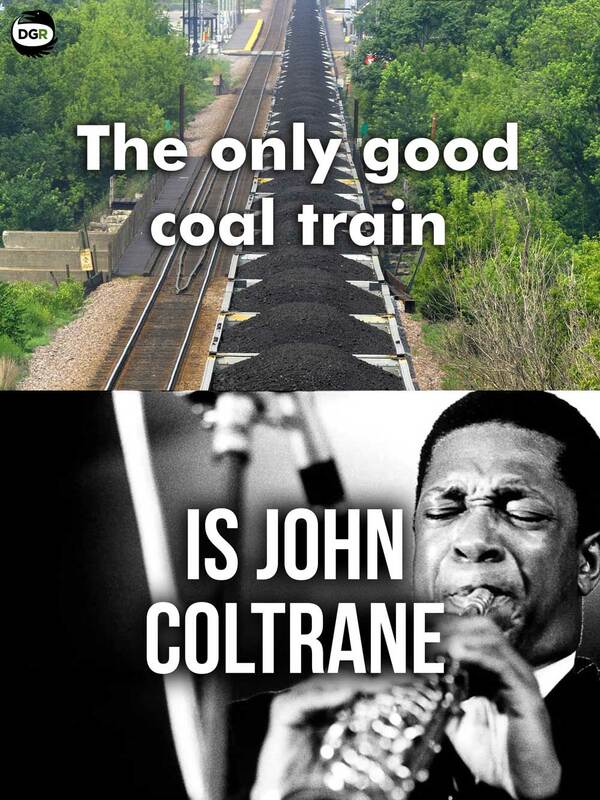 It is estimated that this train carried more than 22 million pounds of coal. Burning this material would release approximately 62.9 million pounds of carbon dioxide into the atmosphere. Update #1 (12:06 am): a second team has blockaded the train, extending the stoppage further! Update #2 (2:59 am): the second team has been removed and the action is now complete. Team is exhausted but we did our best. Lots to learn from this. 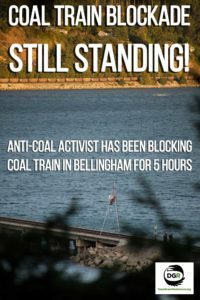 A coal train entering Bellingham, Washington has been blockaded by a fossil fuel resistance group, including members of Deep Green Resistance. 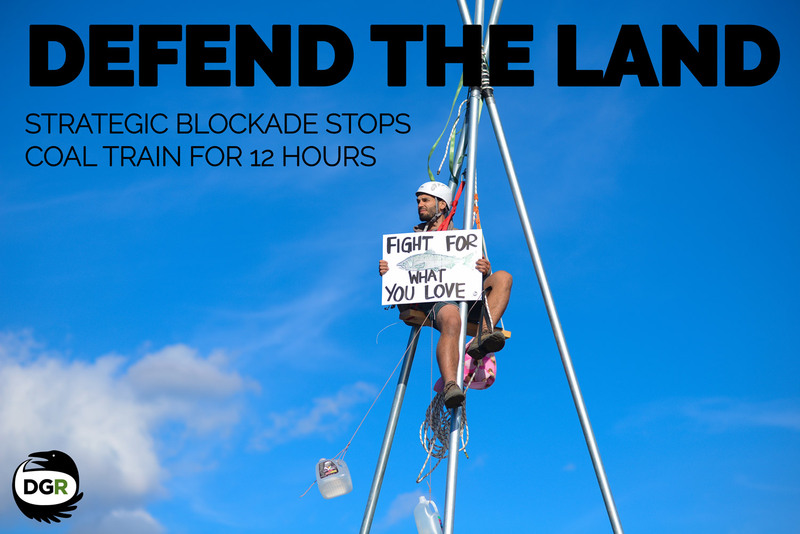 This blockade, part of an ongoing regional campaign against fossil fuels, has been standing strong for eight hours – with no end in sight. Beginning at four PM this afternoon, protestors erected a portable tripod structure in the middle of a rail bridge crossing Mud Bay south of Bellingham. One protester has climbed to the top and will stay until removed by police. The organizers of the blockade say that fossil fuels must be stopped to save the planet from global warming. With two refineries sitting north of town and a tar sands pipeline running underneath, Bellingham has been in the sights of the fossil fuel industry for decades. The struggle to keep fossil fuel transportation out of the small city has been ongoing. The Lummi Nation and other local resisters recently defeated plans for a major coal export terminal. However, coal merchants continue to push for the project. A non-violent disruption of coal train traffic in Bellingham, Washington has been extended after a second group of activists locked themselves to a halted coal train. The train was initially stopped by a blockade consisting of a 30-foot tall metal tripod on a rail trestle, which was dismantled by police around 11:45 pm after 8 hours. 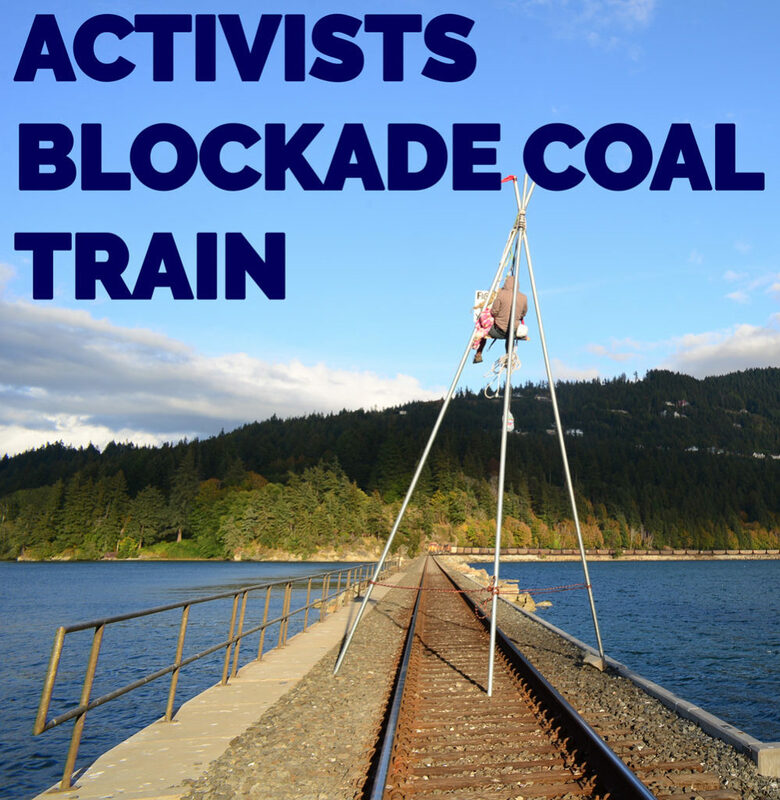 Environmental activists across the region have blocked trains several times this summer, including a mas action in May where 52 earth defenders were arrested while blockading train tracks in Anacortes, Washington. This action is just the latest in a long string of blockades. This entry was posted in Obstruction & Occupation and tagged Coal, DGR activity & statements, Deep Green Resistance, Rail, Washington. Bookmark the permalink. Thank you, Deep Green Resistance. Although the DNR and USACE have denied the permits that would allow this project to move forward based on treaty rights, the Whatcom County administrative staff has not denied the application and closed out its files. It is working secretly with the applicant, SSA, by granting an on-going series of extensions for an EIS made unnecessary by the state and federal permit denial. And part of this project includes more railroad infrastructure and traffic. Pingback: Charges Dropped in August Coal Train Blockade Case!